Using soil-filled sacks (earthbags) for construction has been recently revived as an important natural building technique for several reasons. It is inexpensive, using locally available site soil and polypropylene or burlap sacks, which often can be obtained free or at low cost. The technique demands few skills, and is easy to learn. In addition, building with the bags goes extremely quickly, much faster than any other earth-building technique. They are adaptable to numerous site conditions and can be used with just about any type of fill material available. When built properly, earthbags are extremely strong, and as the bags themselves are lightweight and easily transported, they are useful for remote locations or emergency shelter. Thus, it is a flexible means of construction usable in a wide range of situations to create a variety of forms and structures. A thorough historical survey of building with soil-filled sacks remains to be undertaken. Most evidence for construction using this method is anecdotal. Sacks have of course been used for many decades by military forces to create bunkers and other structures, but it's unknown when they were first used for this purpose. While meant to be temporary, trenches reinforced with oil-impregnated sacks during WWI are still evident today. German architect Frei Otto is said to have experimented with the technique, and more recently Gernot Minke, an architect and professor at the University of Kassel, has engaged in extensive experiments with soil-filled sacks and tubes to create a number of structures, including domes. The author has heard of structures built during the thirties or forties composed of soil-cement-filled burlap sacks, which were then moistened to set the cement. A similar technique has been used for several years at the Colombian community of Gaviotas to create ponds and retaining walls, which are called gabiones. In recent years, the earthbag technique has been advanced by Persian architect Nader Khalili who, with his students and associates, has built a number of prototype structures at his school and research center, the California Institute of Earth Art and Architecture (Cal Earth). He has dubbed the technique "superadobe." Khalili has created a number of innovations in technique and form, and continues to develop this construction method in association with the City of Hesperia. He is working closely with the ICBO to obtain code approval for buildings built with earthbags. The essential material in building with bags is, of course, the bags themselves. Most commonly the bags used are made of polypropylene or burlap. Polypropylene sacks come in a variety of sizes, and are extremely common. It is important that UV resistant bags be used, as deterioration by sunlight is the biggest danger. Recycled seed or feed sacks of polypropylene are often available for free from various sources. The sacks come in a variety of sizes and also come in a tube form, which is much cheaper to buy per square foot. Burlap sacks have also been used, but are not as durable and can also be more expensive, although they are a "natural" material. Custom-sewn bags have been created for special shapes, and "site sewn" custom bags can easily be made using bent nails or wire. The other essential material is that which fills the bag. A number of materials have been used, including sand, clay and gravel. While an ideal mixture would be a standard adobe mix of sand and clay, pretty much whatever subsoil is available is what has been used. The fill material can be used either wet or dry, but moistened material creates a more stable structure. An efficient system is to create your sack foundation and/or walls using soil from site excavation. The most important consideration for bag choice is the material used to fill it. A good rule of thumb is the weaker the fill material, the stronger the bag material must be. In some cases, once a strong fill material has set, the bags could be removed from the exposed areas of the structure without any structural loss of integrity. On the other hand, if a weak material such as dry sand is used, it is essential that the bags be kept integral, and plastered as soon as possible. Additional materials used in construction include barbed wire, used to keep the bags from slipping, and regular wire, which can be used to weave the bags similar to basket-making techniques. For extremely strong structures, cement can be used to create soil-cement mixtures to fill the bags. Old nails are often used to pin bags closed, create new shapes, and keep barbed wire in place. Tools adapted to or developed for this technique are easily available or constructed. A wheelbarrow is used to transport materials and can be used to directly pour soil into larger bags. Stands to hold bags open for filling have been made with a variety of materials. Tube sections of cardboard or PVC, which fit into the longer tube-shaped bags, make filling these bags much easier. Mechanical pumps have been used at Cal Earth with great efficiency to fill the tubular bags. A tamper is an essential tool used to compact the bags once they are in place. The best tamper I have used was created from a 5 foot long 1 1/4" piece of metal pipe welded to a 6x6 1/4" metal plate. Coffee cans filled with soil can be tossed easily and used to fill bags higher up on the wall. Simple forms of wood or metal are used with earthbags to create vaults, while domes are most effectively formed using a simple compass which acts as a placement guide for the bags. An excellent design for such a compass is to attach one end of a lightweight pipe (electrical conduit or an extendable pole used in pool cleaning) to a caster from which the wheel has been removed. This allows for articulation and rotation, and the caster can be easily attached to a 4x4 piece of wood set in the ground at the center of the dome. On the other end of the pipe, an excellent guide is a piece of "L" shaped metal attached with a pipe clamp. In order to create level rows of bags, a small adjustable level is attached near the guide end of the pipe where a person placing the bags can easily see it. Special compasses to create catenary shaped domes have also been developed. In addition to these guides used to create curved forms, I have used portable metal guide frames which are strung with leveling string to create straight walls. The process of building with earthbags is quite simple. The site is first prepared; often a rubble trench foundation is used as a base for bags. Material removed from the foundation area can be saved to fill the bags, setting aside topsoil and organic materials. The fill material is then prepared. Again, subsoil is used, with large rocks and sticks being removed. For small site walls, this soil can be used dry, but for structural purposes, the fill material should be moistened and left overnight. The material should be made wet enough to compact well. Experience and practice will soon lead to proper moisture levels. The first couple of rows are often filled with gravel to preclude wicking of water into the wall. The bags can be filled in several ways. They can be partially filled using a stand or a couple of people holding the bag while the others fill it. The bags can then be moved into position and filled completely. Large bags can be filled in place using a wheelbarrow. Bags higher on the wall can be filled in position using shovels or cans. It is preferable to fill the bags on-site in order to avoid having to pick up and move the heavy bag. Tubes are filled by placing soil in the end, then picking up the end of the tube thus causing the soil to move to the middle of the tube. The tube should be no longer than 20 feet and can be filled from both ends. Another technique is to gather the tubular bag around a 1-2 foot length of pipe which holds the bag open, and allows the bag to be let out gradually as it is filled. A mechanical pump can make these filling processes extremely fast and easy. As bags are filled, the bottom corners can be poked in, a process dubbed "diddling" by builders Kaki Hunter and Doni Kiffmeyer. This process produces a more uniform wall surface, minimizing the use of plaster. The bags are gently laid into place before being tamped. The first bag in a row is usually pinned securely, and subsequent bags are folded closed and laid down with the folded end butted up to the factory-sewn end of the previously laid bag. This is much easier than sewing the bag closed. It is important not to overfill the bag in order to get a secure fold. Once the bags in rows are laid, they are checked to be plumb, or properly placed in the ring of a dome, adjusted if need be, then gently pressed into place by standing on the bag. Once the row of bags is set, the tamper is used to do the final compaction. Compaction is done gradually in order to keep the level relatively consistent (though this is relatively forgiving.) Compaction is done until a "ringing" tone is heard and the bag no longer gives as it is tamped. It is important to lay each subsequent row of bags so that the joints of the previous row are covered by the bags of the next row. In earthquake prone areas, a layer or two of barbed wire is laid between courses to keep the bags from slipping. The wire can be kept in place using nails. Additionally, sticks can be placed between each row as a handy attachment place for plaster. Wooden "gringo blocks" similar to those used in adobe construction can be incorporated into the wall at door and window openings to later attach door and window framing. Another alternative is to set the rough buck for the doors and window as you go, with the bags then laid to it. Because of the flexibility of the bags, this is often the preferred method. Different structural issues arise depending on the type of construction used. For use as foundations, for instance, bags should be filled with gravel to at least a foot above grade, with the final row relatively level to receive the next building material (straw bales, adobe, wood, etc.) Retaining walls can be built with bags, but it is important to provide proper drainage behind the wall, and make sure that the bags are properly secured against slipping. Slight "battering" (sloping back) of the wall can help, as well as compacting the bags at a slight angle toward the earth bank for added stability. Many people are using bags as low-tech foundations for straw-bale construction. They work very well, as they provide the required foundation width easily and cheaply (if the bag is sized appropriately). A waterproof membrane between the top of the bags and the bottom of the bales is desirable in most cases. Rebar can be easily pounded into the bags while they are still drying, and the bags can be stepped on slopes for a stronger connection between bag foundation and straw-bale wall. Narrow tubes of PVC or another material can be placed in the earthbag stem wall as it is built, to provide a chase for strapping used later to tie the bond beam to the foundation. A thin layer of concrete with proper reinforcing can also be poured on top of the bags to create a grade beam and level surface from which to build. Arches can be made with forms to create openings in the walls. The "pointed arch" form has been found to be much more stable than a round arch. Small openings (1 ft. or less) can be created by spanning the opening with wood or metal. When creating arches it is crucial to fill the bags in place and to tamp them to create wedge shapes, which will not slip when the form is removed. Small vaults as door openings have been built with the bags, but larger spans are probably not practical. A special use for the earthbag technique is to make domed structures. The above-mentioned compass makes a dome easy to build. The only really practical dome is one built on a round base (sufficiently buttressed) with the dome being a pointed or catenary shape. It is important to lay the bags in corbels (each ring is flat) in order to avoid slipping in the upper rings, gradually edging inward. Hemispherical domes are impossible without additional formwork, and are not advised. For small spans, the bags can be easily used to create "free-form" domes and arch shapes. This has been particularly pursued by Paulina Wojciechowska. Kaki Hunter and Doni Kiffmeyer have built a dome of bags of gradually diminishing sizes. They covered the resulting dome with cob. A direction worth pursuing is to make domes using bags filled with a straw-clay mixture, providing a better insulation material. An initial prototype dome at Cal Earth was built in this fashion, where the straw-clay bags (which were dried first) were placed over a sacrificial form. In this way a hemispherical dome was achieved. It is important to plaster a structure built with bags as soon as possible, as the worst enemy is sunlight. Bags can be plastered with a scratch coat as they are built. As mentioned previously, "diddling" the bags to push in corners leads to a much more uniform wall surface, with less plaster needed. As the bags often do not provide an ideal adhesion surface, an "adhesion coat" of boiled flour paste or glue, manure and sand is recommended to prime the surface. The sticks laid between bags can also be useful to key the plaster. To date, mud plasters have been most commonly used on earthbag structures. For lime/sand or cement plasters, lath may be desirable. Strings laid between bag courses could be a convenient attachment point for such lath. Domes should be plastered with a cement or lime-based plaster and thoroughly waterproofed except in the driest areas, where mud plaster could be possible. As all these techniques are experimental, plastering is a subject that needs much additional research. The projects at Cal Earth, in Hesperia, California, have sparked the current earthbag renaissance in North America. There are currently at least five structures built at the Hesperia site, with more planned. The original dome project mentioned above has several interesting features. The first is that it is built partially underground, and all material from the excavation was used to build the structure. Additionally, during construction a torrential rain overwhelmed the drainage system, and led to 18" of water in the structure. Because the bags kept the earthen material in place, there was no failure, except for the mud plaster, which was easily replaced. This building later underwent rigorous structural testing for the ICBO, and passed all tests with flying colors. Other projects at Cal Earth include a three-vault house which is sunk three-feet underground. All materials from the excavation were used in the walls. The vaulted roof is made of a soil-cement mixture applied over forms. This structure features a "windcatcher" (a natural ventilation system) and custom window details, as well as a plastering system dubbed "RepTile" where balls of soil-cement are applied to the surface with the joints then grouted. Other small student domes were plastered using the same process. Cal Earth is in the process of building the first code-approved earthbag structures at nearby Hesperia Lake Park. This project will feature earth tube lake-bank retainers, a museum complex, windcatchers and passive solar design. Several other structures have been built at Cal Earth using the tubes. These are recently being filled with a cement-stabilized mix for added strength. I was involved with initial experiments at Cal Earth, inventing the catenary compass as well as other techniques there. I have also applied the technique in several innovative projects around the world. Artist Nobi Nagasawa and I built a temporary sand and burlap bag structure in Prague, Czech Republic (as part of a state-sponsored art exhibit.) Innovations and discoveries here were the use of nails as pins, and a metal plate on which bags were placed so as not to stick to the barbed wire prematurely. Here also, custom-sewn bags were used for the first time. I showed local villagers how to build several structures in South Africa. Here were the first experiments with high-clay fills, cement bond beams on the bags, bag additions to existing structures, and bag landscape walls and seats. Following some experiments by Bill and Athena Steen in Nova Scotia led to the use of gravel-filled bags for wet climate foundations. This technique was also applied to the foundation for a straw-bale vault at the Shenoa Learning Center. For the foundation for a small house project built during the 1997 Colloquium Southwest, in Kingston, New Mexico, I collaborated with attendees to create the dimpling and stick techniques, as well as innovative foundation ideas for straw-bale construction. Nader Khalili's students and others have been spreading the earthbag concept far and wide. 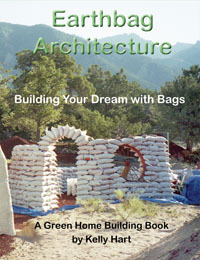 Earthbag houses have been built in Arizona by Dominic Howes and in Utah by Kaki Hunter and Doni Kiffmeyer, and structures using earthbags have appeared in Mexico, Canada, and Mongolia. Straw builder Matts Myhrman has used earthbags for the foundation of a straw-bale dome, and Steve Kemble has used bags to create the first floor of a house in the Bahamas.